Volunteers, from left, Lisa Wax, Shayna and Maryanne Mandelbaum, and Shari, Molly, and Samantha Bates help pack the bounty collected during the Supermarket Sweep. When it comes to helping the needy, providing food has to be one of the most direct and satisfying mitzvas one can do. That sentiment is what has brought parents with their children and folks on their own to support the Supermarket Sweep year after year. On Thursday morning, July 14, carloads of kids and adults arrived at ShopRite in Clark for the two-hour session of finding and buying cartloads of canned, boxed, and bottled kosher foods and cleaning supplies. They came armed with lists of the desired items and the kosher stamps to look for, provided by the Center for Volunteerism of the Jewish Federation of Greater MetroWest NJ. Another contingent descended on the supermarket in the late afternoon. 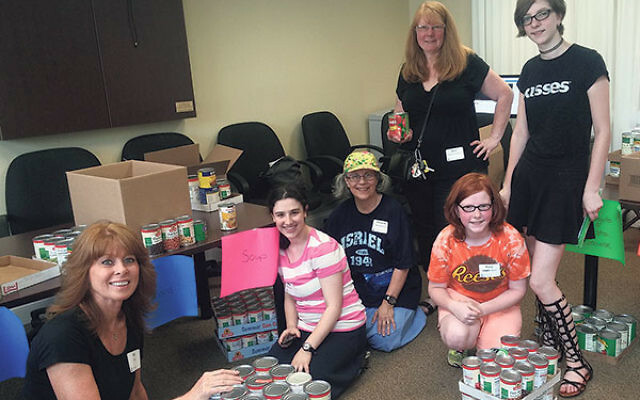 “I’ve been doing the Supermarket Sweep with my kids every time since it began,” said Shari Bates of Fanwood, who — with Samantha, 13, and Molly, 10 — took part in the shopping, and then the sorting and boxing of the bounty at midday at the Elizabeth headquarters of Jewish Family Service of Central NJ. Maryanne Mandelbaum of Elizabeth was there with her daughter Shayna, sorting and boxing what the shoppers had purchased — items like tuna, soup, coffee and tea, pasta, cereal, peanut butter, fruit cocktail, evaporated or dry milk, and cleaning supplies. “It is a good feeling, to help people get the food they need,” Shayna said, and added with a smile that it also counts toward the social service hours required by her school. The one-day shopping spree has helped fill the kosher food pantry run by JFS of Central NJ and also, in recent years, the Bobrow Kosher Food Pantry run out of Oheb Shalom Congregation in South Orange. The JFS Central food pantry distributes 136 boxes of food monthly and an additional 55 emergency bags each month to people needing immediate assistance. Fifteen families remain on the wait list. The agency is one of six affiliated with the GMW federation working to help the hungry in the local community. In addition to the support it receives from federation, the food pantry relies on government funds, donations from grocery stores, and private donations, like the items collected during Supermarket Sweep. This year, the eighth for the event, was somewhat different. The same two people were at the helm, Scotch Plains residents Elyse Deutsch and Janice Weinberg, who came up with the idea. But instead of taking place on a Sunday in March, it was on a midweek date in the middle of the summer, and it was focused — as it had been in the early years — only at the Clark supermarket and at JFS in Elizabeth, rather than at multiple locations. Deutsch’s and Weinberg’s efforts were combined with those of Gerri Rothfleisch of Westfield and Lois Feinberg of Scotch Plains, cochairs (together with Michelle Reback) of Volunteer Boot Camp, a project of the federation’s Center for Volunteerism that pairs those eager to do good with causes that need them. Weinberg said, “A lot of people are away this time of the year, so we thought we might get fewer people.” But then Lindsay Napchen, the federation’s Young Leadership Division manager, came up with the idea of involving the kids at Camp Yachad (at the JCC of Central NJ in Scotch Plains). The camp provided a credit card to cover the cost, and the campers zoomed around the aisles finding the listed items. About 150 people took part, including 60 campers and staff from Camp Yachad, and a contingent of eight people who came from JESPY House in South Orange, a residence for adults with developmental disabilities. In all, they purchased around 2,000 items. Even after all these years, Deutsch and Weinberg said they love organizing the event. “Many people in our Jewish community want to help, but don’t know how,” Deutsch said.